As Jennifer Black Reinhardt put it so well in this post, books take so darn long to make that you’ve got to celebrate them when they’re finally finished. 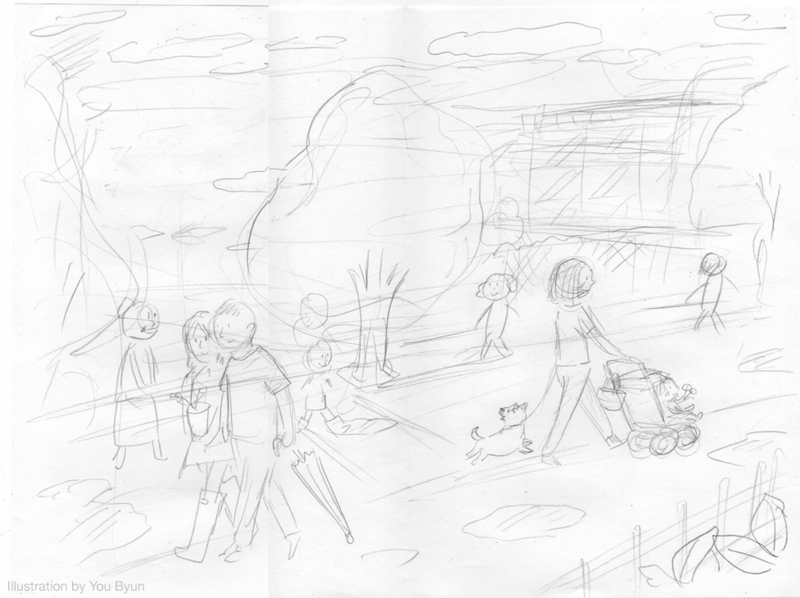 So to celebrate the publication of Little Baby Buttercup (Nancy Paulsen Books/Penguin), I asked the book’s oh-so-talented illustrator, You Byun, to answer a few questions and give us a peek at some early sketches. AND we’re giving away two copies of the book—each signed by both of us—so I hope you’ll stick around! First, a quick introduction. 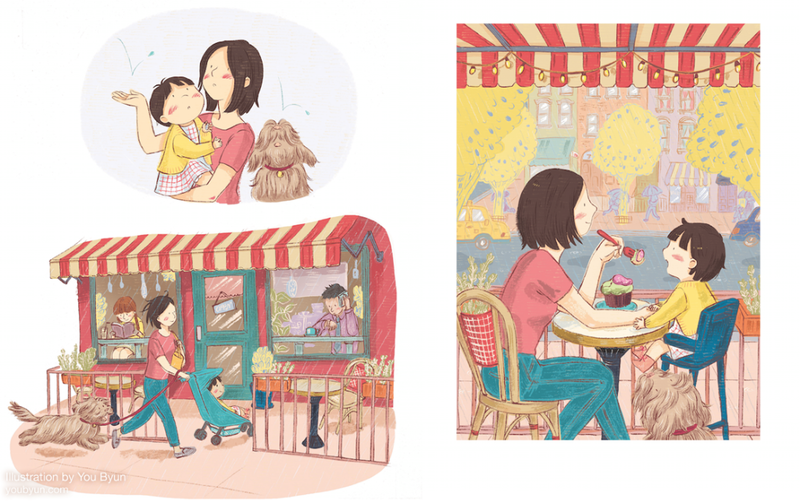 You Byun burst on the scene just a few years ago, winning both the SCBWI Portfolio Award and the Tomie dePaula Illustrator Award in 2010. Her first book, Dream Friends—which she wrote and illustrated—was published in 2013 (Nancy Paulsen Books). 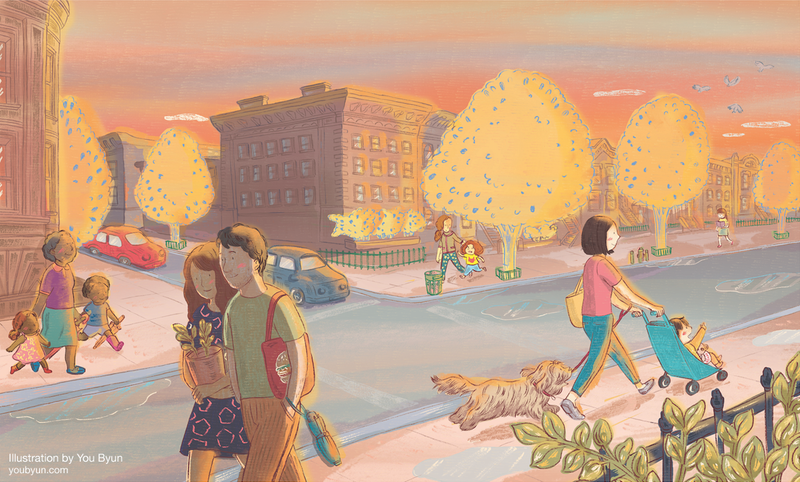 Booklist called it “a visual wonderland,” Publishers Weekly gave it a starred review, and the New York Times said her illustrations “enchant and enthrall and linger in the mind.” How’s that for a debut? Little Baby Buttercup—which explores the joys of toddlerhood (you can find the backstory here)—is You’s second book. For more about You, visit her website, and follow her on Twitter and Instagram. 1. You grew up in the U.S., Korea, and Japan. How has living in different cultures influenced your art? I am fascinated by film, animation and books based on fantasy set ups and I tend to draw things that are not based on real life. I think it’s from my experience living in various cultures. 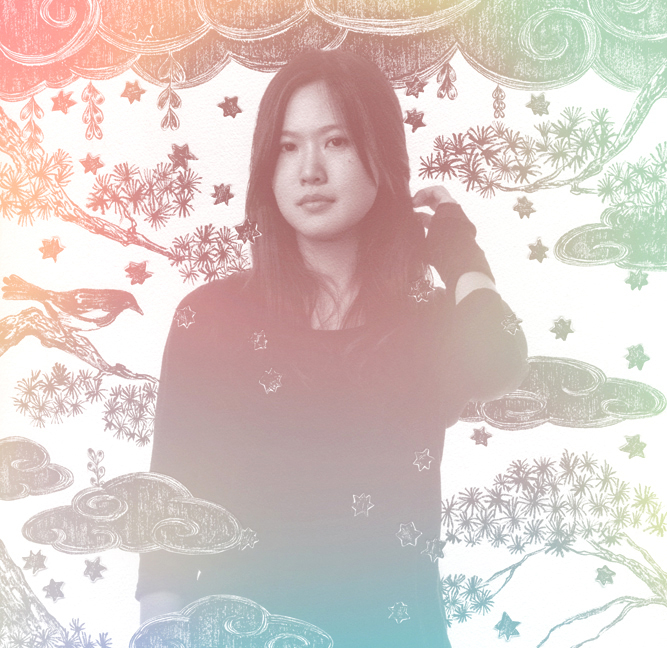 In my art, the emotion and mood in my illustrations and storytelling are from my Korean side. The technical drawing side and composition of my storytelling is influenced by the Japanese culture I grew up in. American culture, where I studied illustration in my adulthood, polished the visual language in my artwork. There are many European storyteller/illustrators I love, such as Tove Jansson, Jean-Jacques Sempé, Tomi Ungerer — they have been huge inspirations to me as an artist. My ultimate dream is to have my unique voice in art and storytelling, like they do. 2. You wrote and illustrated your first book, the beautiful Dream Friends. I’m always curious about how stories develop. As an artist, did you “see” the story first, or did you start with the text, or work on both together? I work on both at the same time. I have tried to write first, but I ended up adding a lot of notes describing what illustrations there should be. I am a visual person but I like to make images with stories. Dream Friends‘ storyline itself was inspired by my own experience of moving around a lot when I was little. I had to make new friends whenever I moved to a new place. I wanted Dream Friends to be about the magic of the friendship, the celebration of imagination and dreams which I care about dearly. 3. Was it a different process for you with Buttercup, since you were starting with someone else’s text? How so? It was very different and fun. When I work on my own story, the world forms up naturally because the world is part of the story already. I know what kind of visual language I want to use for it and what kind of characters there will be. On the other hand, when I got the text of Buttercup, I had to understand the underlying stories of the narrative and figure out what the Buttercup’s world would look like. It’s very fun because I don’t have to worry about the story and just focus on making images within the frame I was given. Or beyond. Also, I never have painted a baby before. I would never have written a story about a baby, so working on someone else’s text allows me to explore things I would not have considered otherwise. 5. I love seeing how an artist’s work evolves from rough sketches to the final art. Can you share some sketches that show how a particular scene or character changed over time? 1) First I showed Nancy Paulsen (editor) and Cecilia Yung (art director) characters with different age groups, because I wasn’t sure how old Buttercup was. 2) Once the age of Buttercup was decided, I presented different hairstyle and outfit. We all liked the short hair. 6. Jill Esbaum recently posted about the importance of going to conferences. 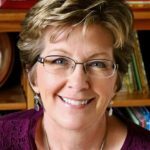 How did winning the SCBWI Illustrators’ Portfolio and Tomie dePaola Illustrator Award affect your career? And what advice do you have for illustrators who are just starting out? I got to have meetings with amazing art directors in major publishers after winning the awards. It helped me to have my name out there and definitely helped my career. Being in a community is very important to me as a freelance artist who often works alone at home. Everyone is there for the shared interest and the energy coming from the same minds is incredibly inspirational. I would go to SCBWI every year if I could. It’s one of the easiest ways to meet people in the industry, who are actually open minded to meet and discover new illustrators. If you are starting out, go to the conference and meet people. And send out promotional postcards regularly. 7. What are you working on next? I am making my 3rd book with Nancy which I am writing and illustrating, and the story will be set in somewhere between surreal world and real world. I am collecting nice names for it. I will be also teaching a Children’s Book illustration portfolio class in Skillshare.com on February, follow me @youbyun (instagram, twitter) for the update on the launch! 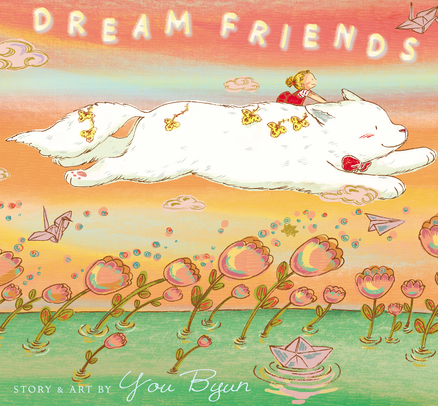 Dream Friends, giveaway, interview, Linda Ashman, Little Baby Buttercup, You Byun. Bookmark. Great interview, Linda and You Byun! I actually met You Byun in Seoul at the English bookstore for her debut of Dream Friends. She autographed a book for my kids. I like the bright yellow of the book cover and the baby. Also enjoyed seeing the sketches. Thanks, Pat. And thanks for sharing it! Great interview. Thank you for sharing your sketches. I love seeing the process. Wonderful interview Linda and You. Thanks for sharing your process. Wahoo!!!! Happy Book Birthday to both of you and congratulations! What a terrific interview. I love hearing how many people work so hard to make a book come true. Can’t wait to see it! 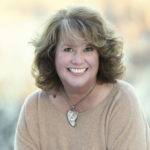 Thank you, Jennifer–and thanks for the inspiration with your post! Hi Love the illustrations of the book. If I don’t win the book I’ll buy it anyways. Thanks for a chance to win. Loved the interview too. Great interview! So interesting to hear about the process. Linda and You, I enjoyed this interview so much. You, your art is captivating and I enjoyed learning about your process when it’s your text and when it’s another author’s. I reminisce about the toddler days, too. Looking forward to reading, LITTLE BABY BUTTERCUP! Thanks, Lori. My “toddler” is going to 17 in a week. Yikes! The illustrations are beautiful, You. I loved hearing about your process and enjoyed seeing some of the early sketches. Linda, this will be a lovely addition to a great collection of books you have written. I really enjoyed reading about You’s process. Thanks for this interview! You’re welcome. Thanks for stopping by, Kristi! Buttercup is adorable! Loved seeing the sketches and the different ways she was imagined. Can’t wait to see more of You’s books and work! Hello, Cathy! I’m looking forward to seeing more of You’s work as well. I’m sure she has many books ahead of her–she’s so talented! Wonderful interview! Thanks for sharing how the collaborative process worked. Ah, yes. Dogs ALWAYS add to the charm, don’t they? Loved this post. It certainly helps one understand the process an illustrator goes through when conceptualizing their stories. I’m interested to know what medium You Byun uses when adding the color to her drawings. Thank you for sharing! Lovely! Those sketches make me miss my kids’ toddler days 🙂 Congrats on the release. I miss the toddler days, too. Thanks, Lori! 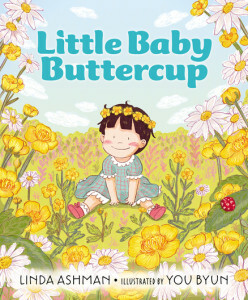 Aah, Little Baby Buttercup by YOU, Linda Ashman and illustrated by You Byun looks so sweet and a must read book. I like the words that You shares ” . . . 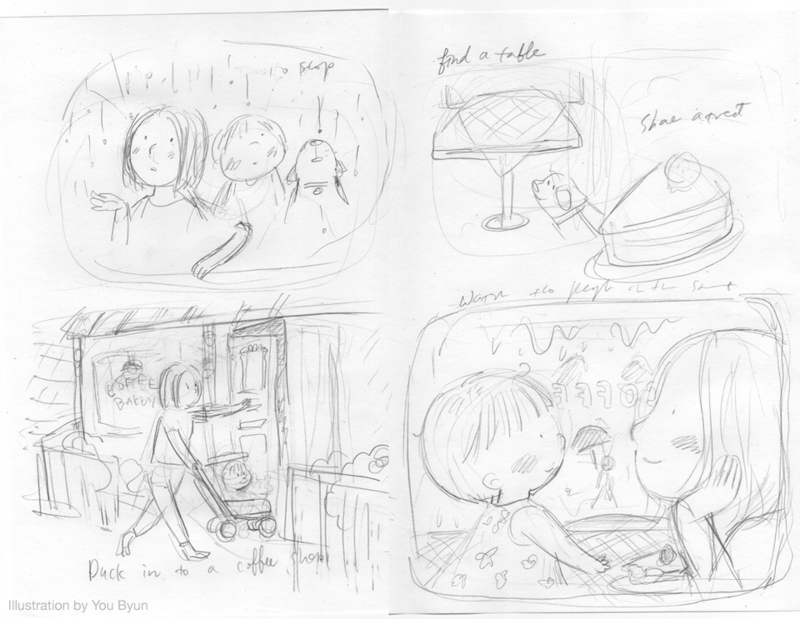 I like to make images with story.” Thank you for an insight into You’s process from rough sketches to final art, Linda. Thanks, Judy. And hello to YOUR Buttercup! You’s artwork is sublime and I’ve always loved Linda’s books. Great interview and exciting giveaway! Thanks for a great interview, Linda and You Byun. Your art has the warmth of familiarity and the gentleness of affection. Beautiful work, and thanks for sharing your journey. Great post! So interesting how the illustrations develop! This was the book read at our library’s storyhour this morning! And I immediately claimed it to check out. Looking forward to immersing myself in the rhyme and the pictures! So happy to hear they were reading it at your library! Thanks, Cindy! Great post. Really refreshing to see an illustrator describe her creative process and the way in which she works with a client. Very original approach. Love to see more of this. Thanks guys. I love seeing how the creative process works too. Glad you enjoyed it, Jamie. Hear, hear! You’s work is gorgeous, isn’t it? Thanks for this interview. The artwork is charming and I can’t wait to see the book. Thanks for a chance to win. Love the interview – and getting to know You (pun not initially intended – but I’m keeping it 😉 ). I definitely need to pick up both of these! Thanks for the giveaway opportunity too! Loved EVERYTHING about this post. Thanks for introducing me to You Byun’s work. Will share your great giveaway, too. I LOVE You’s work..thank you so much for this great post and for the chance at the giveaway! She could start a new trend–the Jennifer Aniston of the toddler set! Thanks, Janet–and thanks for sharing! I’d like to echo the previous comments–thanks so much for sharing the sketches and final art, and the wonderful interview! Great interview and a lovely book! Love this story-behind-the-story interview, Linda. Beautiful book! Can’t wait to get my hands on it. Thank you for sharing the process. I get a sense of peace with the soft illustrations. Thanks, Kathy. They are soothing, aren’t they? My children both love this book (they are 5 and 8 yrs). They love the story, but were initially attracted by the beautiful illustrations. Thanks for sharing your process. My daughter was especially interested as she would like to be an artist/illustrator one day. Wonderful interview. Oops, forgot to say the book they love is Dream Friends. Thanks, Teresa! Dream Friends is gorgeous, isn’t it? So glad your artist-to-be daughter enjoyed meeting You! 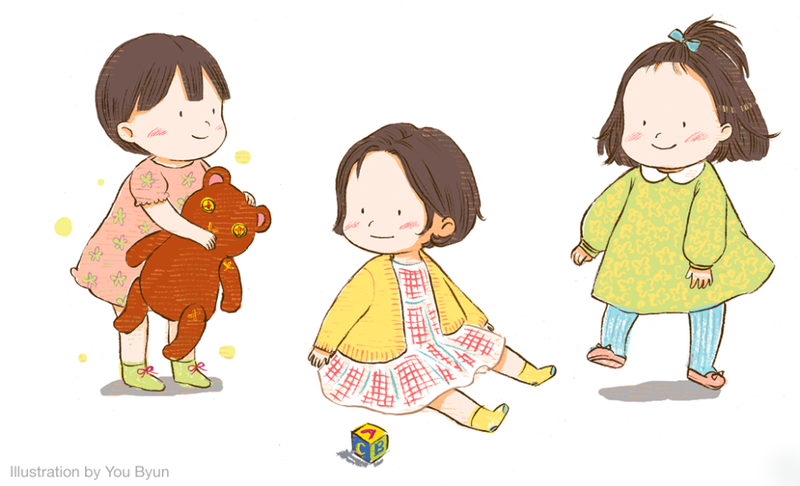 Awesome illustrations, You has such an amazingly cute style! Great to see some of the preliminary work! I’d like to adopt Buttercup! I love how she turned out! Isn’t she cute? Thanks, Kathy! Really enjoyed the interview. Can’t wait to read the book! love the interview, book looks terrific! As a children’s librarian, and mom to a daughter adopted from China, I am always seeking diverse books and characters.. Lovingly illustrate do! Wonderful! Thanks so much, Sharon. What an interesting interview. I love hearing and seeing the process. Can’t wait to read this one! Thanks, Angie. I love seeing the process too! I love learning about an illustrator’s process. Thank you, Linda and You, for sharing this “backstory.” I can’t wait to see this book! All the best to you both. Thanks, Anne. I always love the backstory! Fascinating interview. I enjoyed hearing about the differences between illustrating one’s own text and illustrating another’s. Looking forward to seeing Little Baby Buttercup, Linda and You Byun! Thanks for sharing the thinking behind the illustrations. How old is the MC? What setting can the audience identify with? Etc. Well done! Thanks, Linda. I always think it’s fascinating to see the artist’s process. So fun to see the process. What an adorable book! Always so nice to “have a chat” with an author or illustrator to appreciate their work more fully. Congratulations! Love hearing about the book birthing process. All the effort shows through beautifully in the final product. Yes, I do too. It’s such a LONG process, and so fun to see the transformation along the way. 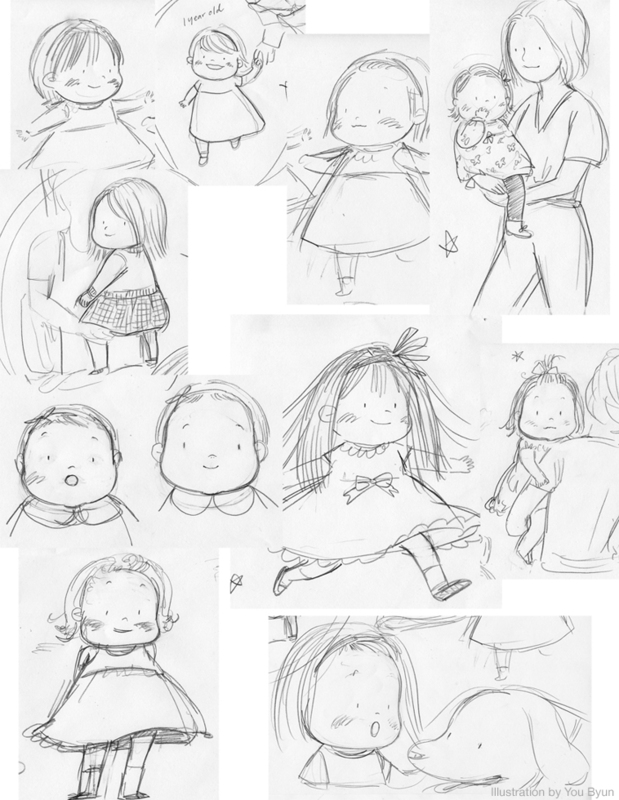 Oh, what fun to get a glimpse behind the scenes of those glorious, golden BUTTERCUP illustrations! Thanks, You! Thanks, Linda! A perfect way to celebrate a book birthday. And thank YOU, Jennifer, for making it all happen! Wish we could all get together to celebrate! I loved hearing about your thought process while working on your book. Thanks for sharing your insights. If I should win the giveaway, please write a note inside to the Little Free Library Walnut. I”ll read the book and then share it with everyone who visits my box of books in the front yard. Congratulations to Linda and You! Thanks to You for sharing your thoughts, your process, and examples of your illustrations from early to end stages. It feels like an opportunity to watch as you think and work. You have expanded my understanding of picture-book making. Yes, it’s such a treat to get a glimpse of You’s process, isn’t it? Thanks, Colleen. Great interview. Thanks, and congratulations on the new book. i am going to share the the story of how Buttercup became a story with Alex and Michael my two Grandsons. They will love the explaination of the process. Oh, wonderful! I love hearing that. Thanks, Ann. Little Baby Buttercup looks like a sweet, snuggly read. Makes me wish my two grown children were toddlers again! Thanks so much for sharing the process. The cute pooch reminds me of my GracieLynn, who’s named after my two granddaughters. Yes, I miss the toddler days too. Sounds like you have a very cute pup, Carol! Thank you, Tammi! I loved reading your interview via Jill’s post! Such beautiful illustrations! I can’t wait to read it! I would love to win this. It looks so beautiful. I’m looking forward to reading the book and feasting on this great art. I thought I had commented earlier, but I guess I read and ran away! Congratulations on the new book. Hey, Stacy. Glad you came back! Thank you! Love hearing about the process and seeing sketches! Beautiful! Thanks for sharing the interview! I remember braiding buttercup bracelets when I was little, but now the lawns are manicured and buttercup-free. I am interested to discover your Buttercup’s character! Loved seeing the “before” and “after” illustrations! Hi everyone — Thanks so much for the lovely comments! Thanks Linda for inviting me for the interview too. What a great blog for a wonderful community. Thank you for sharing yourself and your artwork with us, You. I hope you’ll visit again! Love seeing how a book comes together and I’m especially intrigued by the art! I’d love this! 🙂 You’re so talented! Thank you for sharing your beautiful book. Congratulations! This is a fascinating and informative interview, Linda and You. I love seeing the preliminary sketches and then the finished product.